Through retailer Walmart, Google has been offering a Chromecast and Home Mini bundle for quite some time now at a price of $74. However, at next week’s hardware event, the internet giant looks set to unveil an updated version. Now, it’s worth noting that the overall idea of the bundle remains exactly the same as the current one – it will simply bundle together a Charcoal-colored Google Home Mini and a Chromecast. However, a couple of changes have been made. 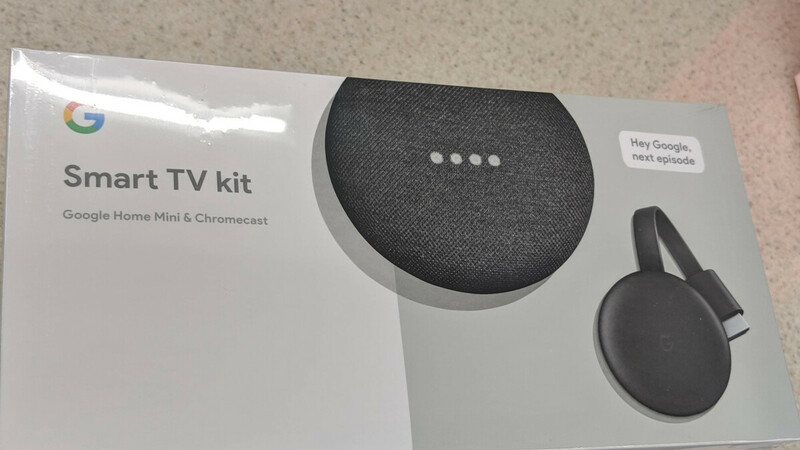 For one, the original name of “Home Mini & Chromecast” has been replaced with new “Smart TV Kit” branding, possibly in the hope of giving consumers a clearer idea of what the bundle offers. In addition to this, Google has swapped out the second-generation Chromecast for the third-generation one that leaked out a few days ago when Best Buy accidentally sold the product to one of its customers. As mentioned above, the current bundle is sold exclusively through Walmart. But considering Google is expected to announce the rebranded version at its hardware event next Tuesday, the company could soon make it more widely available to consumers. In any case, the same price of $74 is to be expected. Give me a remote, period. When I am watching TV, I don't want to have to LOOK at my phone to control the TV or wait for my Home to be ready for, and then respond to my command. Google needs to realize that for proper TV usage, you have to have a physical remote. It just works, the keys are physical so that you can feel them in the dark, and additional features like TV control can be added.